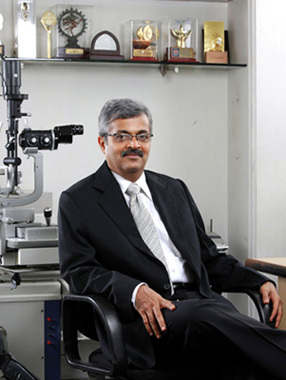 Dr. Vatsal Parikh is a trained vitreoretinal surgeon and eye specialist with 25 years of experience. It is interesting to note that he became retina specialist as his father suffered retinal detachment in 1969 and underwent 10 eye operations in both eyes. This made him experience the plight of retina patients and made his decision to become retina specialist and serve the patients and do research in this field. He had excellent academic career at college; being 2nd in Bombay University in surgery and passed M.S. ophthalmology at first attempt. He did retinal training for 1 year at Sankara Nethralaya in 1988 under Dr.S.S.Badrinath. He has always strived to get the best results in whatever he does in clinical practice and believes in competing with himself only, he has excellent documentation of all patients including their eye photographs and videos and spends time to study them. This has made possible for him to give the best results in retinal field at par with the best of the places in the world. He served at Hinduja Hospital for 20 years as Honarary Consultant Eye Surgeon and retina specialist. He is now devoting full time at his own centre. He has many academic laurels to his credit. His work on Bimanual Vitreous surgery in diabetic retinopathy was selected as the Best free paper in All India Ophthalmological Society Annual Conference 2006. This technique has been instrumental in giving sights to many people who were considered as untreatable patients. His essay on PVR management was judged as the best at All India Ophthalmic Society’s Annual Conference in 1989 at Ahmedabad. He is a coauthor in a chapter on PVR management in Recent Advances In Ophthalmology edited By Dr. Nema. He has passion for teaching. So he has given talks on TV, Radio and holds regular lectures at his place for postgraduate students and also general public. He has done live surgery demonstration of difficult retinal cases at Rajkot, Jamnagar on 3 occasions to groups of eye surgeons. To keep abreast with the latest he visits USA every year to participate in Annual meeting of American Academy of Ophthalmology as he is a member of the same and goes to Frankfurt for the similar meeting; getting the best of both. He always shares his difficult situations with other colleagues on email and keeps patient informed of the same. Honesty, Integrity and Humane approach to all patients is unique to him. "The first and the most important step for a successful doctor is to educate the patients, so they can decide - what is the best course and procedure for themselves".